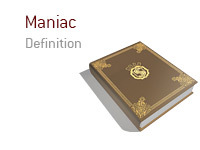 What does the term "maniac" mean as it applies to the world of poker? What is the definition of the term "maniac"? In poker, a "maniac" is somebody who plays a very aggressive and very loose style. The "maniac" will play pretty much every hand in an attempt to run other players over. Smart players will change up their styles in an attempt to trick their opponents. For instance, a smart player might attempt to be seen as a "maniac" during a couple of orbits. This player accepts the fact that they may lose some chips employing this style. After establishing himself as a "maniac", a smart player might then switch up their style to become a tighter, less aggressive player. This may result in his opponents calling the maniac down with subpar holdings and getting involved in hands pre-flop with subpar holdings. There are some not-so-smart players who will employ a maniacal style at all times. These players tend to either bust out or amass massive stacks early in tournaments or cash games. Good players will quickly size up the "maniac" and employ a suitable counterattack.